The number of horses suffering from stomach ulcers in horses is growing, and not only among racehorses. GastriAid's advanced formula is made by leading global veterinary nutritionists. It contains natural gastric acid inhibitors, which help the stomach wall to defend itself against acid attacks, while the pre- and probiotics help with the balance of the pH-value in the bowel environment. These ingredients, together with the herbal support, work on the daily maintenance and care of the intestines. It is difficult to detect ulcers in the stomach without a gastroscope. But there are ways to judge whether your horse might be sensitive, or whether there are signs that indicate stomach ulcers. Horses that stay in the stables for a long time, have a rich grain diet, work hard and travel regularly have a fairly high risk, especially if they are naturally stressed and very tense. There may also be characteristic behavior that indicates the possibility of a stomach ulcer. This behavior consists of: box walking (weaving), wind sucking, nibbling, a 'cold back' or irritability when they get caught up, poor handling, no sense to work, while dull fur or loose feces can also be a signal . GastriAid has been developed to promote the absence of stomach ulcers by helping to build up the natural defense of the stomach wall against acid and maintaining the pH balance in the intestines. This supports the daily protection against stress-related gastric problems, such as the development of stomach ulcers. 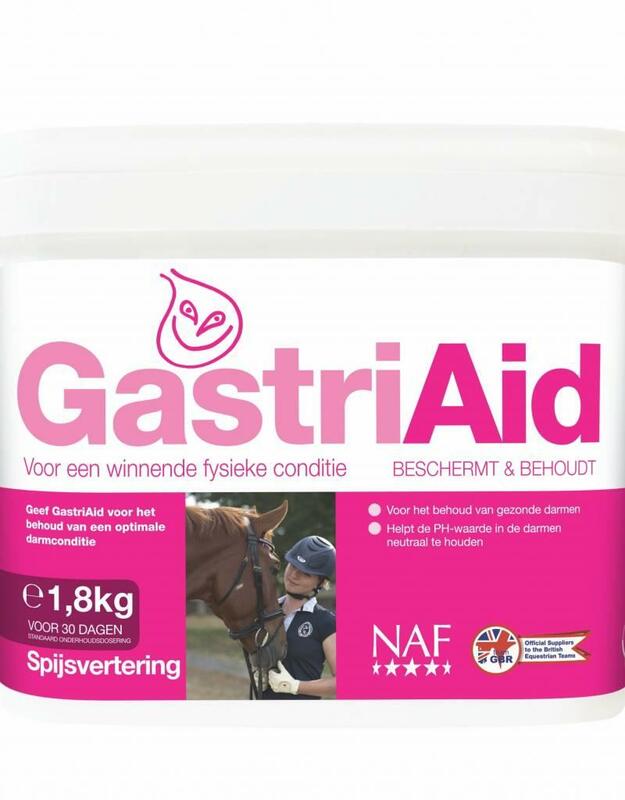 GastriAid gives your horse the stomach wall he deserves, so he can carry out his work easily and as well as possible.